We see things move. We tend to take motion for granted. But when we think about it closely, the notion of motion becomes a deep philosophical problem: How can something move? Butterfield was overoptimistic in thinking the problem ‘overcome’ by 1949. It is really a problem about the nature of space. Only recently—with new insights from the rise of Planck-scale physics and the 3D universe that sequentially replaces itself—are we able to resolve it. The origins of the problem of motion predate physics. 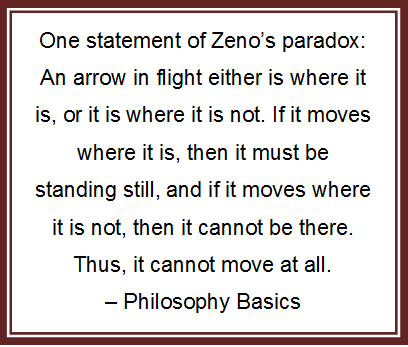 While laying the foundations of modern logic some 2500 years ago, Greek philosopher Zeno of Elea pondered how things can move. He showed that motion leads to a paradox. Much more recently British philosopher and mathematician Bertrand Russell called this paradox ‘immeasurably subtle and profound’. It lies at the heart of his famous failure to set mathematics on a foundation of logic. Zeno said ‘any quantity of space (or time) must either be composed of ultimate indivisible units or it must be divisible ad infinitum.’ In 1856 Bernhard Riemann would found the modern math of space—used to this day in physics—on the basis of this same distinction. Today, Planck-scale physics says that the first option is the right one: space is made of Planck-sized (that is, extremely tiny) quanta or flecks that can’t be subdivided. Zeno said a magnitude that cannot be divided is a contradiction. 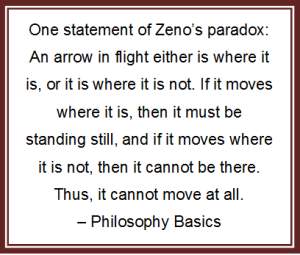 Actually there is no contradiction: Zeno simply could not imagine a real indivisible magnitude. 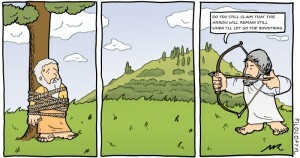 The same can be said of many physicists. But Planck-scale physics and new insights into the origin of the entire universe both say we can understand the world we observe only if it is made of indivisible flecks of space. At Planck scale one must think in terms not of a large composite object like an arrow but of an object that is the fundamental element of matter: a twist in the relation between two next-neighbor flecks. This twist is the basic building block of subatomic particles that make up all we see . 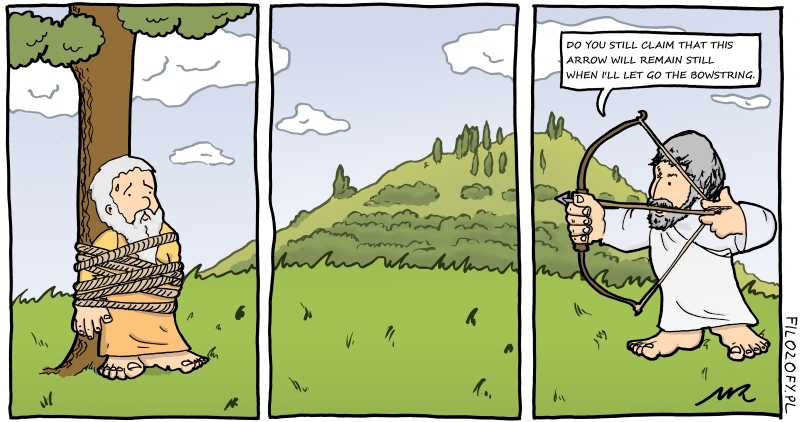 . . including arrows. The arrow paradox vanishes as soon as we think of motion in terms of twists that at each iteration of our 3D universe are either unchanged or move to the next fleck: A twist between two flecks of space is either where it was (in the preceding 3D universe), or it is next to where it was. If it does not move then it is where it was; and if it does move then it is next to where it was. What seemed to involve contradictions now makes sense. The key to the explanation is this: At Planck scale, space is not continuous and what we call time is just a sequence of 3D universes. Thus the twist was never in between the two positions. Planck-scale thinking is simply different!